Seven decade adding and subtracting machine. 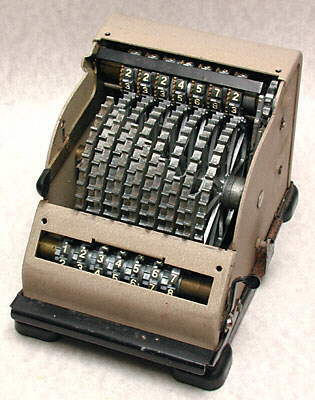 Disk calculator with facility for addition and subtraction, selected by the lever on the left. A number is entered by inserting a stylus in the depression of one of the moving disks against the printed number, and moving down to the bottom of the slot. The disk, having moved, then latches where it is left. This is repeated on the required columns, the total appearing at the top windows and the number just entered appearing at the bottom windows. 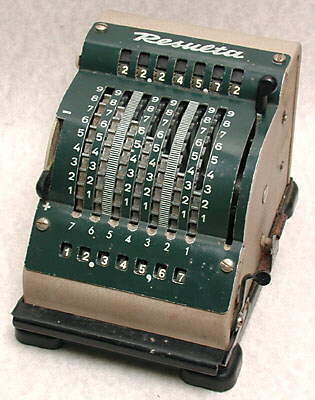 The number entered can be checked for correctness before all the disks are returned to their zero positions by pressing the lower lever on the right. The total can be cleared using the upper lever on the right. In the machine above 12,345.67 has just been entered, and has been added to the previous total to give a new total of 22,245.72. 119 x 152 x 117 mm (4.7" x 6.0" x 4.6"). About 1950s - early 1970s.